The prairie region, as well as its biological diversity, is one of the most endangered landscapes. Active stewardship by landowners is essential to the conservation of the remaining prairie landscape since most of southern Saskatchewan’s grasslands (native and tame) are privately owned. 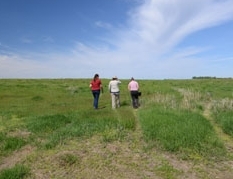 Nature Saskatchewan offers a suite of five voluntary stewardship programs that engage rural landowners and land managers in conserving habitat in southern Saskatchewan to benefit: species at risk from disappearing prairie landscapes, ecosystem health, and people. and 16 endangered or threatened plant species (Rare Plant Rescue). In total, the programs currently have 851 participants conserving over 329,000 acres (133,142 hectares) of grassland habitat and 129 miles (208 km) of shoreline habitat for wildlife and plants across southern Saskatchewan. The goals of the programs are to conserve habitat, raise awareness and provide support to agricultural producers, enhance prairie habitat for species at risk, and search for and monitor target species at risk populations. While the focus is on species targeted by each program, these programs ultimately benefit many other prairie species and their habitats. How Do I Benefit From Being a Steward? Helping to maintain a healthy ecosystem with a diversity of species for future generations. What Do I Do if I Spot a Species at Risk? Operation Burrowing Owl Habitat Stewardship Coordinator, Kaytlyn Burrows, by phone (306-780-9833) or email OBO if you spot a Burrowing Owl. Reported sightings are used to help determine the abundance and distribution of species at risk throughout Saskatchewan. Information is never shared without permission. If species at risk are on your land, you can become a steward! SOS works with the Prairie Conservation Action Plan and the Saskatchewan Burrowing Owl Interpretative Centre to provide information and educational opportunities to the public about the importance of prairie conservation. We participate in PCAP's Pitch for Pipits and Plovers program, and other educational events that visit rural and urban children, teaching them about species at risk, riparian health and grassland conservation through fun games and presentations. Conservation Awareness Day events are held in appreciation of rural landowners who voluntarily conserve habitat for species at risk on their land. Every year, SOS visits different areas of the province to reach these stewards, and to invite and encourage other interested individuals in the community to attend. Conservation Awareness Day events are hosted by communities together with Nature Saskatchewan’s SOS staff. These events are often co-hosted with partner agencies including the Nature Conservancy of Canada, Ducks Unlimited Canada, Old Wives Watershed and the Moose Jaw River Watershed Stewards to reach more landowners and to make the most of attendees’ time. These events provide landowners the opportunity to learn about and discuss issues related to their land and operations, species at risk, and conservation. Events include presentations on Nature Saskatchewan and our SOS programs, beneficial management practices for species at risk, common conservation myths, and funding opportunities for habitat enhancement projects. There is often a field excursion to a local site as well. A highlight of the event is a visit with a live Burrowing Owl from the Saskatchewan Burrowing Owl Interpretive Centre where attendees meet a live owl and learn more about this endangered species. Nature Saskatchewan offers a pasture enhancement program to improve habitat for Burrowing Owls, Piping Plovers, and Sprague's Pipits. Habitat enhancement can take place through reseeding cultivated land to native pasture, wildlife friendly fencing, and alternate water developments. The landowner provides 50% of the project cost, and Nature Saskatchewan provides 50% of the cost. Ideal sites are areas adjacent to or near by an existing pasture (tame or native). Preferably areas adjacent to existing pasture within 3-5 km of Burrowing Owl nests active in the past 5 years, confirmed by Nature Saskatchewan staff, a Conservation Officer/agency, or a research biologist. Preferably areas adjacent to pasture, or designated as critical habitat, or with nesting plovers nearby in the current year or recent past, confirmed by Nature Saskatchewan staff, a Conservation Officer/agency, or a research biologist. Preferably areas adjacent to pasture with nesting pipits nearby in the current year or recent past, confirmed by Nature Saskatchewan staff, a Conservation Officer/agency, or a research biologist. Other Ways You Can Get Involved in the SOS Programs? Volunteers are crucial to the success of the Stewards of Saskatchewan programs. SOS volunteers may help with field surveys, contact landowners, report sightings, share photographs, complete literature searches, and perform office duties. All of these tasks help us achieve the SOS program goals. For more information on species at risk biology, the value of biodiversity to agricultural operations, beneficial management practices for species at risk, conservation easements, SOS program activity reports, fact sheets and posters, and many other informative materials and links, please visit Nature Saskatchewan’s Resource Page. Native grassland plants and ranching go hand in hand. The prairie ecosystem, including its native plant species, evolved under grazing pressure by bison and native ungulates. With the disappearance of bison from the landscape, domestic livestock are now the dominant grazers in our prairie ecosystem, and grazing continues to be essential to maintain healthy native grasslands. And, as any rancher will tell you, healthy grasslands are required for a healthy livestock operation. 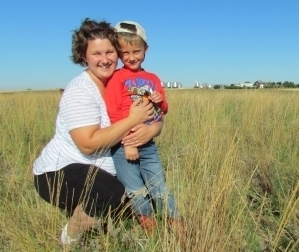 The Rare Plants and Ranchers program, a joint initiative between the Native Plant Society of Saskatchewan (NPSS) and Nature Saskatchewan, offers a practical stewardship solution for ranchers with rare native plants on their lands. 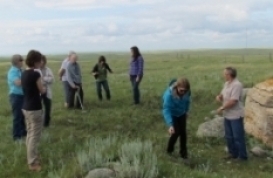 This program complements Nature Saskatchewan’s Rare Plant Rescue (RPR) program, by working with RPR participants to develop site-specific beneficial management plans for plant species at risk using an ecosystem-based, multi-species approach. Step 1: A Professional Agrologist with the NPSS will visit the participating landowner or land manager, to conduct an interview with them to obtain some context about the plant species at risk situation on the land, as well as details about the ranching operation history and current management strategies. Step 2: The Professional Agrologist will conduct range and riparian (i.e. wetland) health assessments on the quarter sections enrolled in the program, and collect data on the rare plant populations present and any invasive species or other threats that may be present. Step 3: The data collected in Steps 1 and 2 will be used to prepare a site-specific management plan for the landowner. In addition to the data collected, the management plan also includes specific management recommendations to benefit the plant species at risk on the land. These recommendations use the best available knowledge, follow specific recommendations included in the plant species at risk Recovery Strategies, and are developed in consultation with the landowners and plant species at risk experts to ensure the recommendations are mutually beneficial and practical for both the ranching operation and the rare plant populations. An example of a recommendation might be controlling the spread of Leafy Spurge (Euphorbia esula). While this would greatly benefit the plant species at risk by reducing competition from a noxious weed, it also directly benefits the producer by improving range quality for cattle. No recommendations that would be detrimental to the ranching operation are ever suggested, and there is no obligation by the landowners to implement any or all of the recommendations. Step 4: The NPSS provides the landowner/land manager with dollar-for-dollar cost sharing to assist them in implementing the recommendations outlined in the beneficial management plan. Step 5: After the recommendations have been implemented, the NPSS and Nature Saskatchewan provide ongoing monitoring of the plant species at risk, in order to assess the effects of the recommendations on the plant populations and habitat, and landowners are given the opportunity to adjust management practices accordingly (adaptive management). Species at risk and their habitat will benefit from the reduction or elimination of threats, increased beneficial influences, and more informed land stewards. Landowners benefit by receiving a comprehensive management plan for the species at risk on their land. This management plan is customized to suit their specific ranching operation needs, goals, and management strategies. Landowners also benefit by gaining access to match funding and ongoing logistical support to help improve their operations to benefit species at risk. Participating stewards receive a free membership to the Native Plant Society of Saskatchewan, which includes a quarterly newsletter. Data collected will update known plant species at risk occurrence data, could contribute new occurrences, and may address knowledge gaps such as identifying trends or factors that help explain the presence or absence of plant species at risk in particular areas. In the long run, this project may help secure additional species at risk habitat. Participants receive information on conservation easements along with their management plans, and will be given logistical support from either NPSS or Rare Plant Rescue to help them establish an easement if they choose to do so. Photos and information about each of these plant species can be found in the Pocket Guide to the Rare Plants of Southern Saskatchewan on our Resources for Stewards page. If you are unsure if you have any of the above species or not, please contact us and we can help you out! If you would like to participate, or if you have questions about the program or plant species at risk, please call Ashley Vass at the Nature Saskatchewan office at (306) 780-9417 or Chet Neufeld at the Native Plant Society of Saskatchewan Office at (306) 668-3940.